From the author of the Golden Globe winner and Oscar nominated Argo, a true-life thriller set against the backdrop of the Cold War, which unveils the life of an American spy from the inside and dramatically reveals how the CIA reestablished the upper hand over the KGB in the intelligence war. Moscow, 1988. The twilight of the Cold War. The KGB is at its most ruthless, and has now indisputably gained the upper hand over the CIA in the intelligence war. But no one knows how. Ten CIA agents and double-agents have gone missing in the last three years. They have either been executed or they are unaccounted for. At Langley, several theories circulate as to how the KGB seems suddenly to have become telepathic, predicting the CIA's every move. Some blame the defection of Edward Lee Howard three years before, and suspect that there are more high-placed moles to be unearthed. Others speculate that the KGB's surveillance successes have been heightened by the invention of an invisible electromagnetic powder that allows them to keep tabs on anyone who touches it: spy dust. CIA officers Tony Mendez and Jonna Goeser come together to head up a team of technical wizards and operational specialists, determined to solve the mystery that threatens to overshadow the Cold War's final act. Working against known and unknown hostile forces, as well as some unfriendly elements within the CIA, they devise controversial new operational methods and techniques to foil the KGB, and show the extraordinary lengths that US intelligence is willing to go to protect a source, then rescue him when his world starts to collapse. At the same time, Tony and Jonna find themselves falling deeply in love. During a fascinating odyssey that began in Indochina fifteen years before and ends in a breathtakingly daring operation in the heart of the Kremlin's Palace of Congresses, Spy Dust catapults the reader from the Hindu Kush to Hollywood, from Havana to Moscow, but cannot truly conclude until its protagonists are safely wedded in rural Maryland. Antonio Mendez is the former chief of disguise for the CIA. A recipient of the CIA's Intelligence Star of Valor and the Trailblazer Award, he is the author of Argo and The Master of Disguise. Visit his website at TheMasterofDisguise.com. Bruce Henderson is the author of Fatal North and the coauthor of the #1 New York Times bestseller And the Sea Will Tell. He lives in California. Admiral Stansfield Turner former head of the CIA A true story of spying with all the suspense and intrigue of a James Bond novel. Publishers Weekly An entertaining thriller with the added virtue of being true. Booklist An endlessly fascinating book, one that spy buffs will return to again and again. Hayden B. Peake curator of the CIA's Historical Intelligence Collection For CIA staffers, the changed names will be both frustrating and challenging as they attempt to sort out individuals and operations. 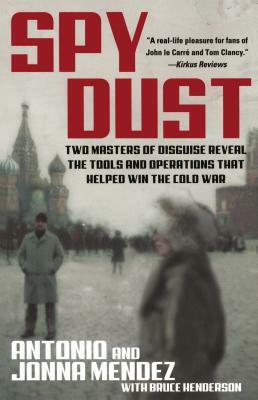 For those who want a sense of what really takes place in the field when magicians from the Office of Technical Services are involved, Spy Dust is a rewarding experience. Kirkus Reviews A real-life pleasure for fans of John le Carré and Tom Clancy.